In attendance at a photocall ahead of the 2018 TG4 All-Ireland Junior, Intermediate and Senior Ladies Football Championship Finals, are Junior Intermediate Senior finalists, from left, Kate Flood of Louth, Cathy Mee of Limerick, Ceannaire Spóirt TG4 Rónán Ó Coisdealbha, Ciara O'Sullivan of Cork, Sinead Aherne of Dublin, LGFA President Marie Hickey, Neamh Woods of Tyrone and Niamh O'Sullivan of Meath. TG4 All-Ireland Ladies Football Championship Finals Captains Day at Croke Park, in Dublin. Photo by Eóin Noonan/Sportsfile. 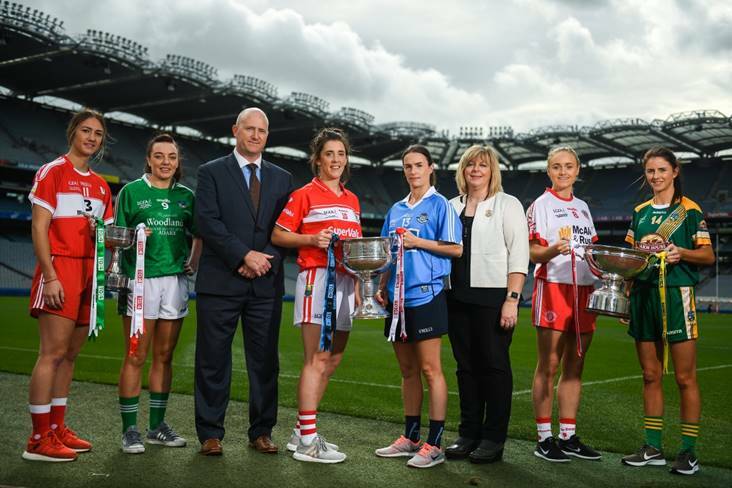 THE scene is set for the 2018 TG4 All-Ireland Ladies Football Finals – with a spectacular triple-bill in store at Croke Park on Sunday. Louth and Limerick will battle it out for the Junior title, Meath face Tyrone for the Intermediate crown and Champions Dublin tackle Cork for the Senior silverware at GAA HQ. Dublin are aiming to retain the Brendan Martin Cup for the very first time in the county’s history, following previous successes in 2010 and 2017. Standing in their way are 11-time champions Cork, who are back in the Senior Final for the first time since 2016. Cork and Dublin have met four times previously in Senior deciders, with the Leesiders emerging victorious on each occasion, including three successive Finals in 2014, 2015 and 2016. JUDGEMENT day has arrived for Cork and Dublin – and with a real sense of unfinished business surrounding this TG4 All-Ireland Senior Final. Dublin have never beaten Cork in a senior decider – and suffered defeats at the hands of the Rebelettes in 2009, 2014, 2015 and 2016. But the Sky Blues are current holders and eager to set the record straight against their big-city rivals. The chance presents itself at Croke Park on Sunday as Dublin, carrying 14 of the 2017 final starters, take on a Cork side with just seven starting survivors from the 2016 decider. It’s a role reversal of sorts as Cork were the more established team in previous finals, with Dublin viewed as transitional and on the rise. Now, it’s Dublin who are the dominant force while Cork have been shorn of a host of former All-Ireland medallists and legendary figures in recent years. While both sides have been scoring heavily throughout the championship, recent history suggest that this could be another tight and tense encounter. In their five outings, including the Leinster final, Dublin have amassed 20-66, or an average of 4-13 per game. Of that combined tally, captain Sinéad Aherne has chipped in with 4-24 along the way. In six matches, and taking the Munster championship into account, Cork have scored 25-80. When averaged out, it’s roughly 4-13 per game, and very much in line with what Dublin have been registering. Cork’s leading scorer is Orla Finn on 1-27, closely followed by a player who’s been coming off the bench to make a big impact. Saoirse Noonan, the former minor star, made her senior debut against Kerry in the Munster final, scoring 2-2 in the second half alone, and she’s chipped in with an incredible 6-11 in total. Skipper Ciara O’Sullivan has also contributed handsomely, landing 6-7 in the 2018 championship. The defence that holds up best could well determine the outcome of this one, and both teams are well stocked in that regard with leading stars. The respective goalkeepers, Dublin’s Ciara Trant and Cork’s Martina O’Brien, have also enjoyed excellent campaigns. With another big crowd expected at Croke Park on Sunday (last year’s final attracted a record 46,286 attendance), the scene is set for a mouth-watering encounter. Between them, these two counties have racked up the last 13 All-Ireland Senior Titles on offer – Cork winning 11 with Dublin victorious in 2010 and 2017. But the win they really want in a final is Cork, and that sense of having to prove themselves against the Leesiders should ensure that a highly-motivated Dublin team storms onto the Croke Park sod. Sparks should fly – and this 2018 TG4 All-Ireland Senior Final will be a game to savour. Tyrone arrive at Croke Park on Sunday aiming to exorcise the ghosts of 2017, when they contest the TG4 All-Ireland Intermediate Final against Meath. 12 months ago, a fancied Tyrone fell to Tipperary at Croke Park, and were denied the chance to regain senior championship status. But Tyrone have bounced back impressively this year and appear to have the Mary Quinn Memorial Cup firmly in their sights. Standing in their way are Meath, as the Royal County prepare for a first All-Ireland Final in the adult grade since 1994, when the Junior title was annexed. This is a very first Intermediate Final for Meath and the manner of their semi-final victory over Roscommon, when they dismantled the Connacht champions on their home Dr. Hyde Park patch, should serve as a warning to Tyrone. The Red Hands stormed through the Ulster championship and All-Ireland qualifiers with ease – but have had two stern tests against Wexford and Sligo in the knockout stages. Those games should have Gerry Moane’s charges primed for what lies in store against Meath, who may find the wide-open spaces of Croke Park to their liking. With fast and pacey forwards, Tyrone’s defence will be tested to the limit but the Ulster champions possess classy forwards of their own. Stacey Grimes, Fiona O’Neill, Marion Farrelly, Vikki Wall and inspirational captain Niamh O’Sullivan have the ability to hurt Tyrone on the scoreboard but Tyrone can call upon the likes of Gemma Begley, Áine Canavan (daughter of Tyrone legend Peter), and goal threat Chloe McCaffrey. Moane has opted for three changes in personnel following the Sligo win – as goalkeeper Shannon Lynch, Niamh McGirr and Emma Mulgrew come in for Laura Kane, Aimee Daly and Christiane Hunter. Perhaps not surprisingly, Meath supremo Eamonn Murray has named an unchanged starting line-up. Interestingly, Mairead McGuinness MEP, Vice-President of the European Parliament, has a daughter on the Meath team, Orlaith Duff. And as a Louth native, it will be a most enjoyable day for Mairead McGuinness, who is a renowned follower of Ladies Football. AS it was in 2010, so it is at Croke Park on Sunday as Limerick and Louth lock horns in the TG4 All-Ireland Junior Final (11.45am). Eight years ago, Limerick made off with the West County Hotel Cup but there’s plenty of water under the bridge since then. Louth lost another final in 2012 but finally got their hands on the silverware three years ago – and will hope to make it two Junior titles in four seasons at Croke Park. Louth needed a late goal from skipper Kate Flood to edge past Derry, as Limerick had a crucial penalty goal from 2010 final star Dymphna O’Brien in their victory over London. Louth may have beaten Limerick twice in Division 4 of the Lidl National League this year but this looks like being a much stiffer test for the Wee County. Rebecca Delee netted two goals in that game and will present a threat to Louth, who are determined to put on a show and honour the memory of former manager Mícheál McKeown, who sadly passed away in June. Darren Bishop, the current Louth boss, has performed impressively in the role since taking charge in difficult circumstances, managing the natural grief within the squad along with the more clinical business of winning football matches. The Junior decider will pit two excellent teams against each other, while the buzz in Limerick was evident during the week when a morning breakfast fund-raiser for the Ladies Footballers attracted a 400-seat sellout. Manager John Ryan was joined by his senior men’s hurling counterpart John Kiely, with the Liam MacCarthy Cup in toe. Limerick will hope that more silverware is headed to Shannonside – but Louth will have something to say about that.